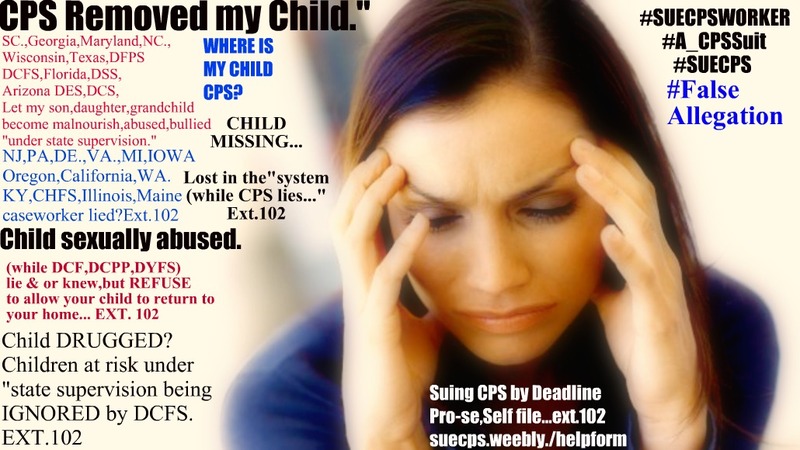 "lawyer told me i can't sue cps ever." exclusive 1-on-1,first of its kind Inter-Connect-Chat-LIVE Ctr. FALSE ALLEGATIONS CENTER,FOR THOSE SUING CPS BY DEADLINE,PRO-SE. court,(again)agree "PARENT was VIOLATED,along with 2 children." Be sure to prior to calling-in,to fill out by clicking here,to fill out accordingly. "those who learn and sue...CPS, timely.. Sitting around online day in,day out complaining is not ACTION. that would be with OR without lawyer,to sue cps. ANOTHER WIN validated for parent who sued CPS. NEW LAWSUIT WON AGAINST AGAINST WORKERS AT CPS. JUST AWARDED TO VICTIM(s)OF C.P.S. constitutional rights of us,the Good loving families,violated." "as a family,and timely,and WON against C.P.S." seen below,and violate one's rights. We wish you all the best of luck. 1-844-331-4667.